There are still too many people in the world today who incorrectly believe that slavery came to an end long ago. Public awareness campaigns are therefore essential, since if modern slavery is not acknowledged, there is little chance of making significant progress tackling this crime. A lack of awareness means neighbours will not recognise the circumstances of the domestic worker next door. Traffickers will make their profits right under the noses of authorities. Victims won’t receive the help they need and might even be prosecuted themselves. We need a shift in social norms so that trafficking is recognised as trafficking, a form of modern slavery, and as an unacceptable crime. 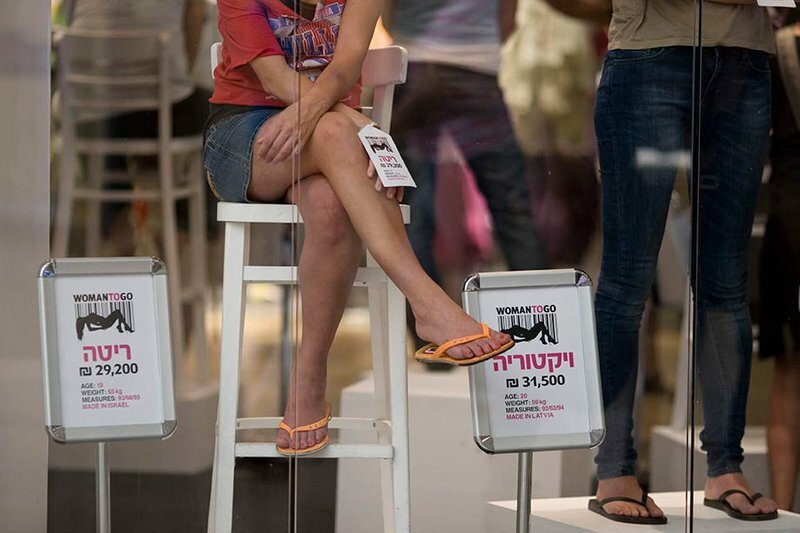 An Israeli women's rights campaigner sits priced and barcoded in the display window of a Tel Aviv shopping mall to protest human trafficking in 2010. Ariel Schalit/Press Association. All rights reserved. The overall impact of having a number, albeit an estimate of uncertain precision, is that it has brought to life the public conversation about modern slavery. It is not always easy to trace a clear path between anti-slavery campaigns and political change, as any advocacy evaluation will attest. However, public campaigns have certainly helped to generate a platform for change. Giving child rights campaigners the ability to go into a meeting with government officials with the clout of 80,000 signatures behind them gives strength and power to their calls for better protection measures, as ECPAT UK found when they were advocating for a stronger Modern Slavery Bill, having partnered up with WalkFree.org. The final act included a statutory defence to protect victims from being criminalised, a clause to ensure children without proof of age are treated as children, and a commitment to roll out nationwide a trial ‘advocates’ scheme for child victims of trafficking. Cutting too many corners in the pursuit of public attention can come at a long-term cost.